CBD Oil Supercritical Fluid Extraction: There are several ways to extract CBD oil from the hemp plant. Some methods use solvents, which may leave residues, or heat, which can destroy valuable nutrients. PlanetHemp uses CBD oil extracted with a Supercritical Fluid Extraction process. This uses very low-temperature, high-pressure CO2 to extract all the nutrients, vitamins and enzymes without harming them. The CO2 is recycled and leaves no residue, resulting in very pure CBD oil with the full complement of plant-derived compounds. Our Hemp Seed Oil is cold-pressed from 100% Canadian-grown hemp seeds. With our many years of experience in the hemp seed industry, we have developed unique processes to ensure the cleanest, finest quality hemp seed available today. We then use a cold-press process to extract the hemp seed oil while preserving the maximum nutritional value. A natural, whole plant extract supplement that provides essential nutrients for our Endocannabinoid System (ECS). We would suggest that you take a moment to research information on the benefits of CBD’s; especially those sites that are not trying to sell you anything – you may be surprised! The best single source of Omega 3 & 6 essential fatty acids; in the perfect ratio for our bodies. 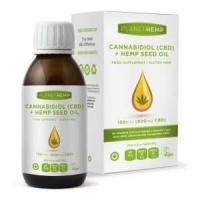 Each 150ml bottle contains 600mg of CBD and provides 10mg of CBD per our recommended 2.5ml serving; taken twice a day as a food supplement this will be sufficient for 30 days. Our Cannabidiol (CBD) + Hemp Seed Oil is the result of a unique partnership between the most knowledgeable hemp growers and processors in Canada and Europe, representing decades of experience and world-class expertise. There are several ways to extract CBD oil from the hemp plant. Some methods use solvents, which may leave residues, or heat, which can destroy valuable nutrients. Our CBD is extracted using a Supercritical Fluid Extraction (SFE) process. This uses very low-temperature, high-pressure CO2 to extract all the nutrients, vitamins and enzymes without harming them. The CO2 is recycled and leaves no residue, resulting in very pure CBD oil with the full complement of plant-derived compounds. Our Hemp Seed Oil is cold-pressed from 100% Canadian-grown hemp seeds. Over many years we have developed a unique system to ensure the cleanest, finest quality hemp seed available today. We then use a cold-press process to extract the hemp seed oil while preserving the maximum nutritional value.